It has taken me a while to collect my thoughts after Friday's amazing concert. On Friday the 13th of October, 2017, we witnessed pure musical and performance magic in the Royal Albert Hall. Below will follow not so much a review but more an attempt to describe the emotional journey a concert like this takes its listeners on. Something completely beyond words and description occurs, and this is what I will try to find the words to convey. The regular readers of my blog will remember that I have told you about the wonderful Marillion before on many occasions. Their music has been an inspirational backdrop to my life for several years. Here we go again. When the band announced that they were going to perform in the enigmatic Royal Albert Hall, I just knew I had to get tickets. That in itself was not an easy task as the tickets sold out incredibly fast (I have heard that most of the tickets were ripped away in less than ten minutes, but I could be mistaken here…). But at last, with the help of a link from Stephanie (Marillion management, thank you x), I managed to get three tickets (and at that point I didn't care where we were seated, as long as we got tickets), one for my twelve-year-old son, one for my partner and one for me. We were going to see Marillion in the Royal Albert Hall! Royal Albert Hall has been the epitome stage of musical and cultural expression since 1871. And for that reason it is not difficult to understand why playing there is considered a massive honour and a high point in one's career. Marillion definitely deserve to finally grace this classical venue with the music that, in my opinion, is a ticket to a better life. I want to keep them to myself, but on the other hand, the whole world should know the songs as I do...the world WOULD be a better place, of that I have no doubt. So, the concert...on the way in we were given finger lights for audience shenanigans for the song GO! which was one of the things my son was looking forward to..to be honest, so was I. We found our seats, and felt the magic descending just by sitting there in the iconic hall, surrounded by the echo of history. We looked around and could see familiar faces in every direction, smiling, anticipating what was about to bring us together, the music and lyrics, and musical and vocal deliveries of world class. Among the 4555 people there, I was first of all ecstatic to share this experience with the two favourite people in my world, my boyfriend and my son. Smilingly we looked around, our finger lights ready for later, now the concert could start. When Marillion walked on and started the concert by playing their latest album, FEAR, I was a bit surprised for a second or two. Not that I didn’t like the fact, but I thought, you are here, you have so many great, iconic and legendary songs you should be playing instead...but I was about to be educated. I finally understood FEAR (and obviously I know that the music you have to work to understand often ends up being the music you appreciate the most. I have listened to FEAR almost nonstop since I came home). Right there in Royal Albert Hall, I completely broke down. I see it now! With the help of the beautiful and sometimes disturbing films showing on the big screen behind the band, the songs from FEAR took on completely new meanings, and the lyrics stood out in a way that only a live delivery can provide. What I take from their live version of FEAR is that the album is an important comment on the society of consumption and consumerism. Capitalism and Neoliberalism are definitely at the top of any political decisions made in the world, and these are matters we should and must address from a cultural perspective. Marillion have never been afraid of speaking up (for example, their last album, Sounds that can't be Made addressed the conflict in the Middle East), and FEAR is no exception. Artists and cultural commentators have been the legislators of the world through history, and I hope they continue to be. And just maybe their voices will make the moneymakers think...maybe? But FEAR is not only about the new kings of the world, it is also about how the life of a touring band really is. The Leavers 1-5, Wake up in Music, The Remainers, Vapour Trails in the Sky, The Jumble of Days tell the story of how overwhelming and beautiful, yet bittersweet and heavy the emotional journey of what life on the road is like. But The Leavers gets its fantastic finale with the amazing fifth song, One Tonight. It is a profound musical statement of what it is all really about, why they do what they do, why we love them so much, we come together in music and we’re all one tonight. When this pearl of a song came I was left in tears, happy, cathartic tears, and I really felt as one with the band, the fans, the venue, it was absolutely sublime. The rest of FEAR took our breaths away, and the anticipation definitely grew for the second part of the concert. This part started with Seasons End’s The Space. Now, on stage, were a string quartet, a French horn and a flute. The proper instruments played live sounds so much better than the sampled sounds (no offence x). There is a tangible and vibrant authenticity to the way a violin sounds in the hands of someone who knows how to play it. I grew up in a family where Mozart and Bach were daily musical backdrops, so I salute Marillion for putting these brilliant young musicians on stage. Steve Hogarth confirmed his position as one of the best singers in the world of progressional rock today. The last part of The Space is in a high key where he sings with a full tone (not falsetto), difficult on a good day. But he completely nailed it. I can only imagine (being a classically trained singer) how he must have felt doing a song of that difficulty level in a venue such as Royal Albert Hall. If he was nervous about it, he hid it well, as his voice was pitch perfect, full toned, and just brilliant. After a stop by the sun in Afraid of Sunlight, the band continued to play one of the most beautiful and emotional songs in their entire catalogue, The Great Escape/Falling From The Moon from their concept album, Brave. We all fell from the moon with the band...and we all rose stronger and wiser. But it was soon time for GO! we had to get our finger lights ready. Easter from Seasons End brought another moment of deep reflection concerning destinies around the world. What would you do, make a stone of your heart...? No, you can't make a stone of your heart when submerged in music the way we were in Royal Albert Hall. We breathed in syncronicity, we were one the whole night. Then we GO! 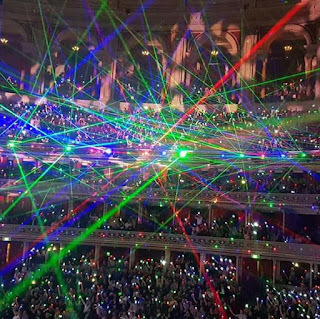 The light show was spectacular from the beginning, multicoloured lasers transported the audience to the inside of a dream, on a cloud, upside down…wide awake on the edge of the world. We put our finger lights on, and started counting. It had to be correct; we were not going to be premature lighters…one, two, three, four…and then…had I not been singing with all the others at the time, I would have been left speechless. Even thinking about it now makes the hair on my entire body stand up. 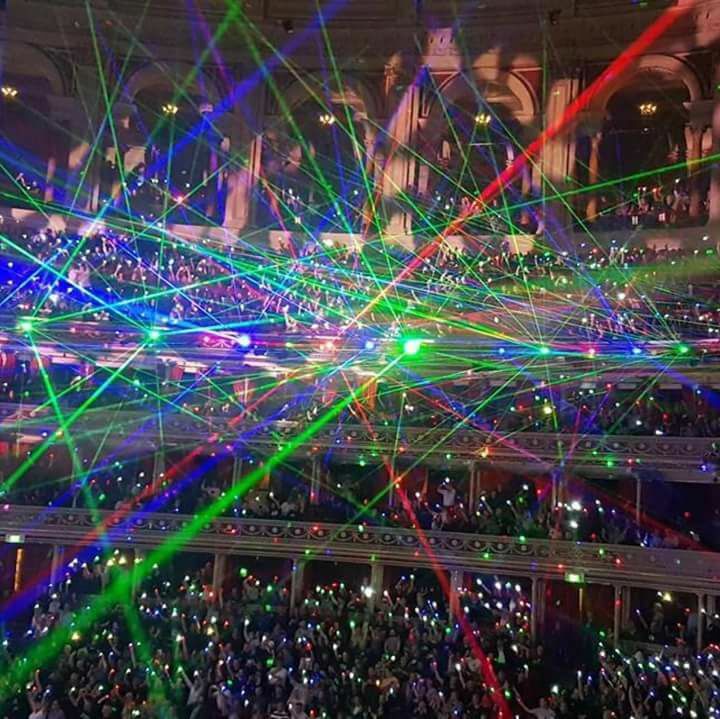 The picture below is from that exact moment (pictures from Marillion’s page), but the picture, though beautiful, does not give a fair representation of what it really was like to float on the fluffy clouds of light and music, to have the soft rhythm of Mosely’s drums beat with the rhythm of our hearts, to have the harmonies of Kelly’s keyboards flow through us like the blood in our veins, to have the deep notes from Trewavas’ bass touch every nerve in our body, to have the enigmatic guitar of Rothery help us see into heaven and then finally Hogarth’s velvet voice guide us safely towards the dreamy, otherworldly existence where the only thing is now. I imagine all the ghosts of great musicians and performers from the past were sitting on the gallery with their dangling feet and fluttering wings, letting these hours of heaven on earth reaffirm their trust in humanity. My son was, and still is in awe of his first proper rock concert experience, one that I think might be difficult to top...but we will obviously take him to see more Marillion for (hopefully) many years to come. We all had an absolutely amazing time. Your compassion for your fellow man is admirable, and I sometimes wonder how you can look at people in the way you do, with interest and understanding. You admire people for their originality and eccentricity, rather than judge them for their otherness. I have not met anyone capable of this other than you. Other people, both people I know, and people we observe in the world, might believe they are capable of not passing judgement, but really most of us are narrow minded and judgmental, myself included. But not you. I would love to see the world through your eyes, I believe that is a beautiful world that has room for everyone, and definitely a world I love that I'm a part of. This compassion is also visible in how you treat everything non-human as well. Having observed you carefully catch an insect in your hands and release it outside, is nothing short of heartwarming and amazing. You are curious. When you find something that is of interest, you research it, learn about it, and are capable of talking about it, passing on what you have learned. I love to listen to your little narratives about both the past, present and future, and I hope you'll always keep this curiosity in your life. You are gentle. I have never heard you raise your voice and get carried away by negative emotions. You are absolutely amazing. You are funny. Your quiet humour is one of your best qualities. Sometimes when you tell a joke, you tell it with a straight face, and I have to think for a bit. But then it dawns on me that it was a joke, and I realise how funny it was...And I love how your face always is ready to smile. You are caring. You help me carrying my troubles with me rather than leaving me alone with them. When ever I'm in pain you know, almost before I do, and instead of going away and not deal with it, you wrap your strong arms around me and let me know (almost without saying a word) that everything is going to be OK. And when I get overwhelmed when, for example, writing a master thesis, then you have an ability to calm me down and make me realise that I'm actually doing exactly what I intended to do, working as I should, and figuring things out. You make sure I remember my qualities, and that is one of the most powerful gift you can give to another person. You are generous. If it wasn't for you, the times we spend together, living in different countries as we do, would not have been as frequent as they are. You are passionate. I have honestly never felt more loved in my life than I do with you. I hope I show you as much love as you show me, because you deserve all my love for as long as I can breathe.